Last week, San Diego Gas & Electric announced a first-of-its-kind contract for behavioral demand response -- a deal with Ohmconnect for 4.5 megawatts of energy flexibility, available within 20 minutes notice, from its existing and growing pool of engaged homeowners across Southern California. The contract, tucked into a broader 83.5-megawatt energy storage procurement that included AES Energy Storage, Renewable Energy Systems Americas, Powin Energy, Enel and Advanced Microgrid Solutions, didn’t garner a great deal of attention. Prices weren't disclosed. SDG&E’s press release also contained a typo, Ohmconnect CEO Matt Duesterberg said in an interview. The San Francisco-based startup is not working with commercial and industrial customers, as the release claims -- residential customers, both existing and new, will make up all of its 4.5 megawatts of flexible capacity, set for delivery in 2018 and beyond. Ohmconnect has already been delivering megawatts' worth of behavior-based load reduction for Pacific Gas & Electric and Southern California Edison under the state’s Demand Response Auction Mechanism (DRAM) pilot. It’s not unique in this regard -- companies including Stem, NRG Energy, Ice Energy, EnerNOC and Advanced Microgrid Solutions are also DRAM participants. But these aggregations are still officially in pilot stage, whereas the SDG&E deal represents “the first aggregated demand response in California” to go beyond it, he said. Specifically, Ohmconnect is providing resource adequacy, or the energy capacity that SDG&E and its fellow utilities must procure to meet ramps and peaks in grid demand, within a 20-minute response window. Ohmconnect does use smart thermostats and other in-home energy devices, to the extent customers have them, he said. But its primary mode of squeezing quick-response demand response out of its customers is behavioral -- encouraging and guiding them in how to turn down air conditioners, turn off TVs, unplug appliances, and the like. Utilities have long run demand response programs that automatically shut off people’s air conditioners, although these have generally failed to get beyond the low single-digit percentages of residential customers to sign up and stick with it for more than a year. They’ve been slower to adopt the fuzzier outcomes of behavior-based demand response in their grid planning, however. But early efforts on that front, such as Opower’s work with Baltimore Gas & Electric, have begun to provide the industry real-world measures of how reliable and effective it can be. California turned to demand response from 50,000 Nest thermostats to help mitigate potential power shortfalls caused by the Aliso Canyon natural-gas facility closure last year. Other utilities are pushing customer behavior through time-of-use pricing, as Sacramento Municipal Utility District has been doing for some time, and as all California investor-owned utilities will have to do by the end of the decade. Ohmconnect’s contract with SDG&E differs from its DRAM contracts in a few key ways, including a faster 20-minute turnaround, compared to day-ahead and hourly warnings under DRAM. But the startup has found that its customers actually respond more vigorously to last-minute alerts like these, he said. Doing both together, as it does with its DRAM customers, gives a marginal advantage in response, but not that much, he said. A typical home can shed about a kilowatt of load for an hour or two without sacrificing too much comfort during the hot late afternoons when it’s most likely to be called on. Some customers are gung-ho and reliably deliver a lot more savings. 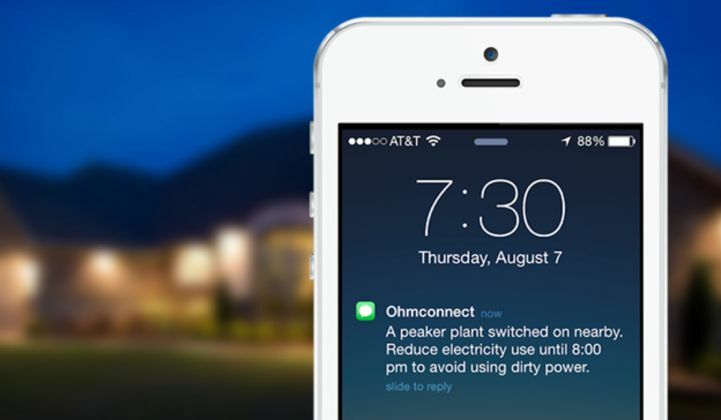 Others do little, or only do something when they’re home, or leave it up to price triggers on thermostat setbacks they’ve set up through Ohmconnect’s cloud-based platform. The more homeowners are signed up, the larger the likelihood that they’ll act in predictable ways as a collective, firming up the resource. Duesterberg declined to say how much Ohmconnect will be paid for the megawatts it has promised SDG&E, or on which particular terms. But he did note that it’s going to be a lot less expensive than the energy storage projects SDG&E picked up in the same week. It’s also less expensive than the utility-administered residential demand response now operating in California, he said. Those run between $140 and $160 per kilowatt-year, based on figures on base interruptible load program spending for PG&E and Southern California Edison, he said. But utilities are paying about $100 per kilowatt-year for what they’re getting from the third parties under the DRAM program, he said -- a figure derived by dividing the $6 million program cost, minus about $500,000 in administrative costs, by the 100 megawatts of resource delivered so far. This cheaper, market-driven approach is just what the California Public Utilities Commission was looking for from the DRAM pilot as it considers whether to make it the foundation of a wholesale change in how demand response is carried out in the state. Today, DRAM participants are paid on the prices bid into the day-ahead markets run by state grid operator CAISO, but future stages may allow them to earn money based on the real-time prices as well, sweetening the deal for customers. As for what’s in it for the customer, Ohmconnect has paid out more than $2 million for the energy using changes they’ve accomplished so far, or about $50 to $100 per household per year, he said. It’s small compared to the multimillion-dollar potential from a single commercial or industrial site -- but its potential for multiplication stretches into the millions.